My friend, also my colleague, lost her Mother last week and naturally I feel very sad, more so because our lives touched. Like my Mom, she was kind and generous. I met her a few months ago. I was de-cluttering and asked my friend if she was interested in large containers. She said yes and I packed half a dozen for her to take. Not wanting to give empty containers, I filled one with biscuits. As it happened, she couldn’t come home to pick them up as she returned home late every evening. I told her not to worry and said I would drop them off, since she does not live far from my place. So I set out, with the large bags and after some difficulty found her place. Her Mom welcomed me in. She was pleased that I had dropped the containers off and insisted that I have some coffee. Now, that’s usually an offer I can’t refuse – and didn’t. Conscious that I had to get back home as soon as possible as I had work to do, I had the coffee and got ready to leave. Then, rather reminiscent of my own Mom, she asked if I had had breakfast. I hadn’t. She refused to let me leave and said there was no way I was returning home without eating breakfast at their place. What followed was a very loving experience that reminded me so much of my own Mom. I had masala dosa with coconut chutney and sambhar, which she made while I waited. I felt pretty much like a beached whale after I topped it off with another coffee. When I finally got ready to say ‘bye, she gave me a coconut and two chunks of jaggery. Traditions vary, but it is usually customary in South Indian families to offer married women a turmeric and vermillion when they leave. 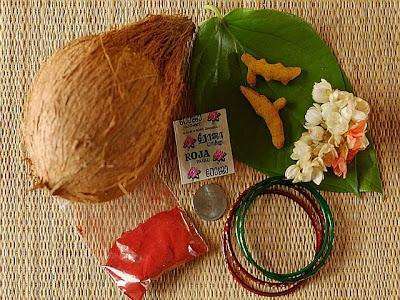 If available, a coconut, fruits, betel leaves with betel nut, flowers, a gift and so on. Sometimes we add bangles depending on what day it is. It is especially auspicious to offer this on Fridays. So, anyway, my friend’s Mother offered me bangles as well. But they did not fit, so I gently declined them. Just as I reached their gate, she asked me to wait and rushed back in. She brought a little box with these beauties inside. Ceramic salt and pepper shakers. She said there was no way she was going to use them and gave me the box. I was, of course, delighted and as soon as I reached home, couldn’t wait to place the set on my kitchen shelf where I would see them every day. As the months went by, my friend’s Mom decided to replace all her kitchen containers with the set I sent her, and I was inspired to pass on another dozen or so. And each time I would send her biscuits, because my friend told me they became her Mom’s favorite. We were all worried when she had to be admitted in hospital when her health took a turn for the worse. Sadly she did not recover and breathed her last two weeks ago. Her eyes were immediately harvested and thanks to her, someone has the gift of sight today. Today they had the “vaikunta samaraadhane” – these are rituals performed on the thirteenth day after a person dies and the day when the departed soul reaches its heavenly abode or vaikunta. I was invited for lunch and went along with Vidur since he was back from school. We had a sumptuous lunch in the traditional South Indian style served on a banana leaf. The cooking was superb and I thanked the caterers who had lovingly served the food, cajoling everyone to eat a little more of this and a little more of that. Later, while leaving, my friend took me to her kitchen to show me how her Mom had arranged those containers. I just couldn’t speak, I didn’t trust my voice. I came back home with a full, yet somewhat heavy heart. Who knows when a loved one will cease to exist. So please, celebrate all those lives you touch with love, the lives that touch yours, however fleetingly. Don’t hold grudges. Look at the positive side of things. Don’t forget to feel grateful. Don’t forget to say your I love yous. 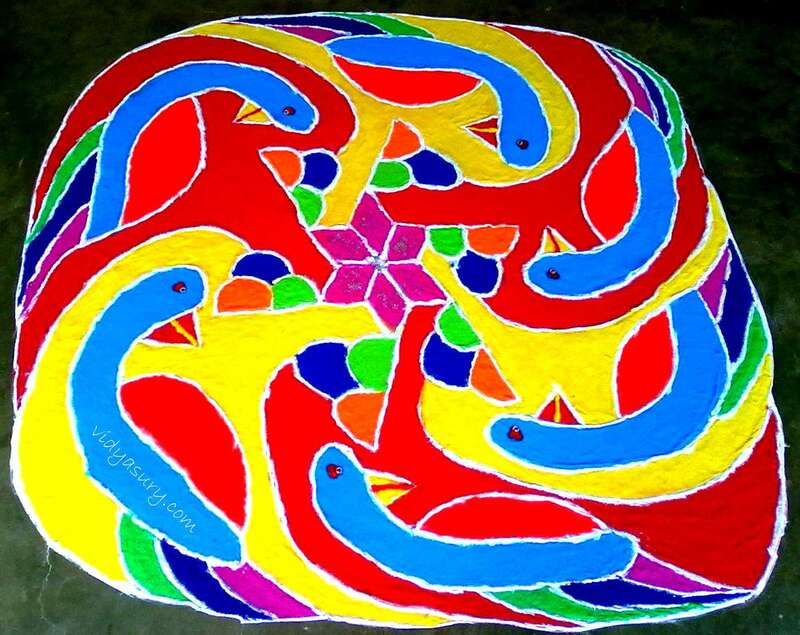 May your life be as bright as these rangoli designs made by children – school kids! They are colored with colored powder. The base is white – mixed with colors to produce different shades. 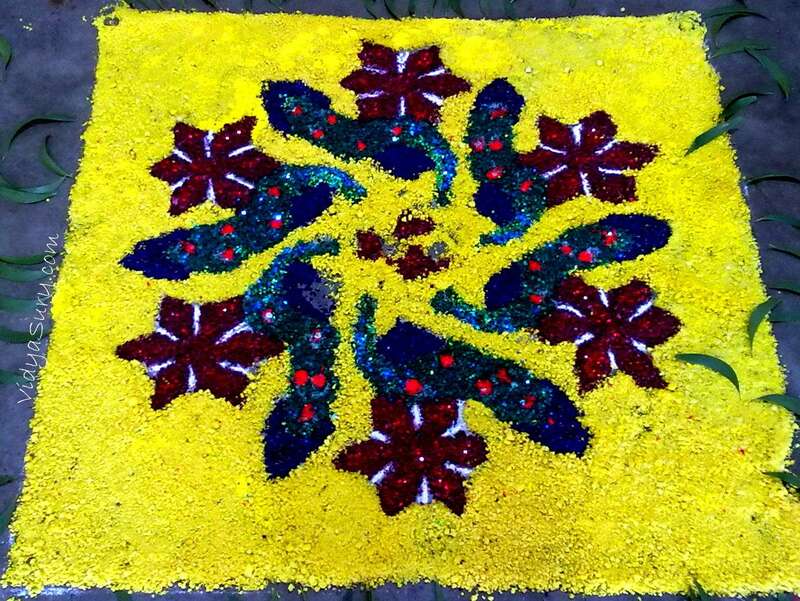 Sometimes flower petals are also used. Have you been touched by love? How? P.S. : I’ve validated my word count for the NaNoWriMo although my novel is far from done. Did you participate? How’s it coming along? Linking with the lovely Unknown Mami for Sundays In My City. We like traveling the world together. This was such a loving wonderful tribute to your friend’s mother. We never forget the lovely food that people serve us, we might forget their faces, their voices, but the taste of their cooking can never be forgotten, can it? 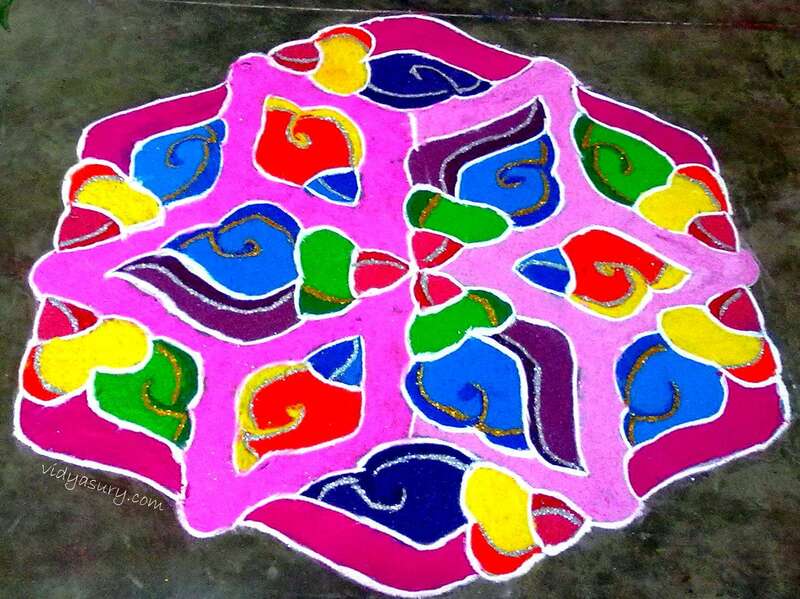 I love the rangoli designs made by the children – beautiful. That is wonderful that you had that loving exchange with your friend and could have some closure. Life is unpredictable, so wise words to “So please, celebrate all those lives you touch with love, the lives that touch yours, however fleetingly.” Thank you Vidya! You are so right, Vidya! Life is impermanent and we should truly treasure every special moment. I feel more open and receptive to love and therefore also more loving than ever before. I’m very grateful to my husband for his part in this. Thank you for your kind heart. I’ve been ‘touched by love’ so many times I’ve lost count. I try sincerely to touch others by love, particularly those less fortunate than me. These could be simple things that need no expense and almost no effort: addressing a waiter/sweeper/etc. by name, requesting (not ordering) them, thanking them, acknowledging their greetings, etc., etc. 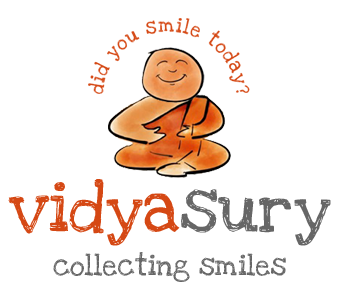 Proactive Indian recently posted…Little gestures, huge impact! Such a beautiful and touching post.. we really need to cherish the time we have with our near and dear ones..esp. when we do not know what tomorrow has in store for us. A very beautiful tribute to a very beautiful mom. We often understand the value of our loved ones only when they move away from our life… even I realised the same when something I like this happened to me. Embrace your loved ones more closer to you each day. Vidya, this is a very moving tribute to a Mother. Small things matter a lot. I was touched by her spirit of grateful thanks for the containers. So sorry that such a compassionate lady is no more. This is Life! The rangolies are awesome. So colorful! 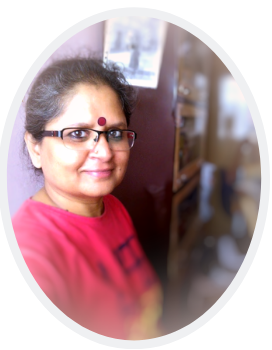 Usha Menon recently posted…Haiku Heights #310 – Thanks! This is such a heartwarming and inspiring post, Vidya! Yes, I have been touched by love, many times and remembering them always leaves a happy smile in my heart. Sorry about your friend’s mom though! May she rest in peace. Your posts strike a chord everytime.When we acknowledge the fact that human life,all life for that matter,is evanescent and ephemeral we realise how tightly we are gripped by our petty concerns. We are not sure about the next moment, yet we go about occupying ourselves with the most mundane and trivial potterings.Our loved ones are there with us for a little while.The Hindu scriptures point out that we are here with a raeson;to resolve our karmic issues with everyone,and the best way to do taht is to love evry one around,to forgive,to give,and to share our happiness with others. Vidya I loved the post. And I found it so amazingly sweet which is a definite characteristic of all your posts. Yes we often find that the life is too short for us to communicate what we feel for someone. Richa Singh recently posted…Five things I believe in- I Believe week is on! What a beautiful Tribute to your friends mum. We are all touched by love more than we ever realize or appriciate, taking the time to spend with loved ones and friends, being grateful for them and life and appricating the little things can truly change your world. “So please, celebrate all those lives you touch with love, the lives that touch yours, however fleetingly. Yes, I have been touched by love…so many times. I also like to believe that I have touched many a lives myself. 😀 Yeah am proud of that too! Sorry to hear about your friend’s mom. So nice that she has left with so many happy memories with you. the gesture of giving gifts when someone leaves one’s home is really nice. I especially liked that! As always, you put things into beautiful perspective Vidya. 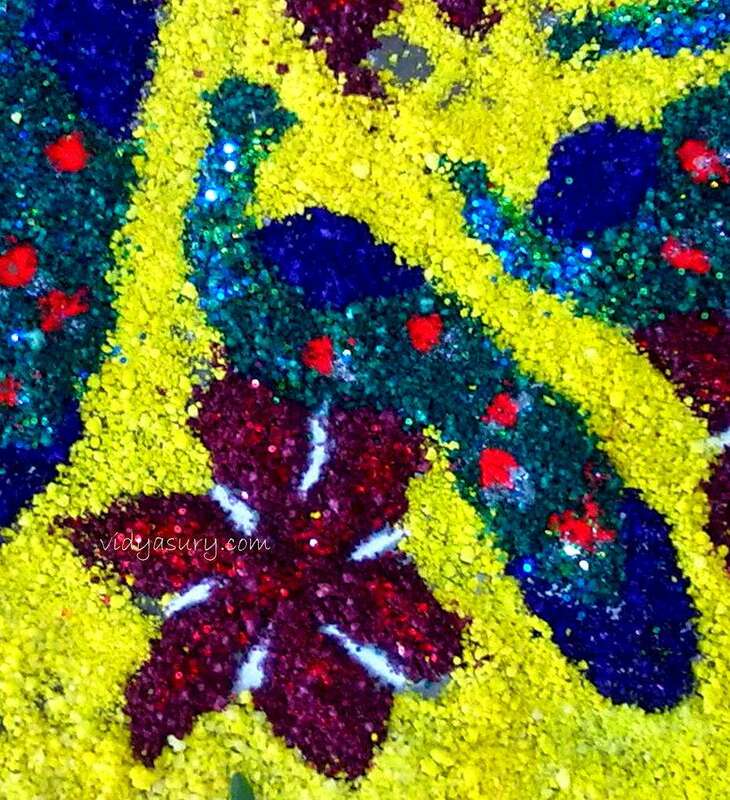 Love the rangoli, so vibrant and full of life. you are a beautiful prayer, Vidya. LOVE you more than chocolate and marshmallow. I came over to see who you were after you RT’d a tweet and what a wonderful surprise to a) find your blog and voice and b) to read today’s love note. You definitely made me smile today and allowed me to feel the love in my own life. Thank you. That was beautiful. A wonderful tribute to a kind and loving person. An honest & straight-from-the-heart write up . Life is simple & beautiful . Donno why people tend to complicate it . Thanks for reminding us about the existence of love in our lives . Love is purest in simplicity, and that comes through well here. Thanks for sharing, Vidya! This is so heart-warming. Your friend’s mother reached out to people through her actions of love. I too have been touched by love and its a very nice feeling. 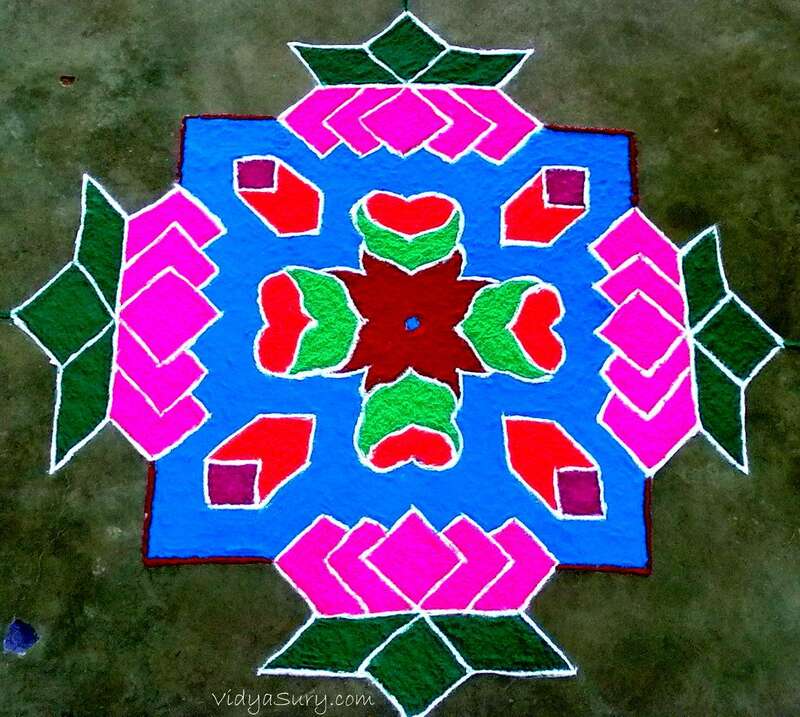 loved the colourful rangolis. 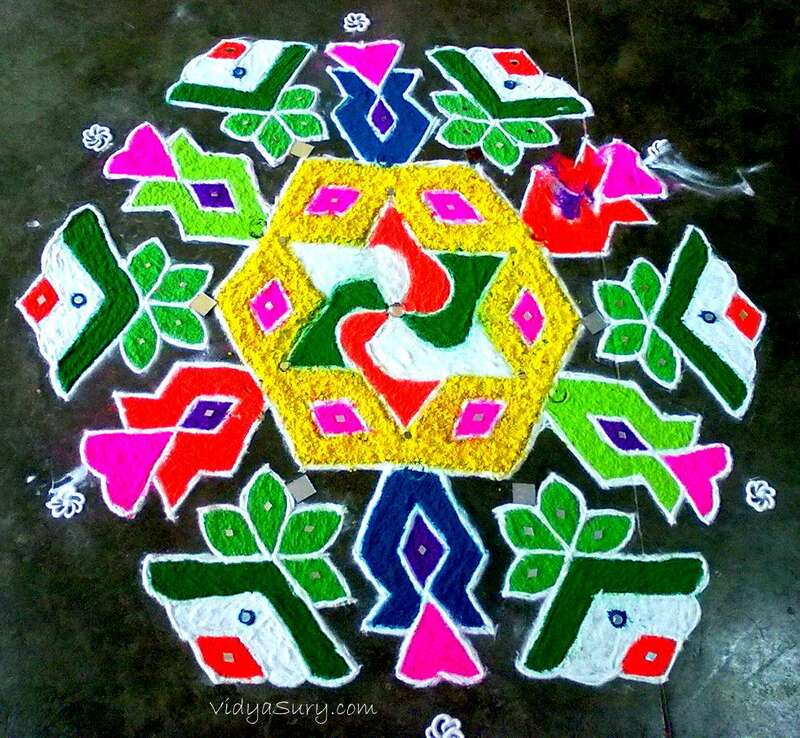 I don’t know what is more beautiful – the rangolis or your friend’s mother’s gestures.